Cedar Creek is a Family Friendly Campground with 62 full hookup RV sites, Driving Range, rental camper, Lodge, 24 tent sites and a group tent site. We are focused on a good experience for all guest. Picture yourself practicing your golf swing at our driving range, shopping at the antique shops, paddling down the Big Cedar Creek or fishing out your back door. It is all possible here at Cedar Creek Park, our RV Park in Cave Spring, Georgia. 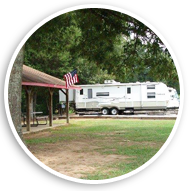 When you stay at our campground near Rome and Cedartown you will have access to all the attractions in northwestern Georgia has to offer, plus activities like fishing, Striper fishing, golfing, boating, Canoeing, Kayaking, hiking, biking, and much more. Join us today and see what Georgia camping near Weiss Lake is all about! Big Cedar Creek is a great float trip for beginners and pros alike. The natural beauty of the creek is unmatched in Georgia. The wild life abounds in this country float trip. Whether you are renting one of our boats or have your own, you will love the trip. White water ripples are all part of the fun without the large river scares. 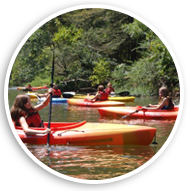 We have kayak and canoe rentals for singles, families or large groups. It is easy and fun. Do not forget, you can camp right here. We also have a lodge, rental camper and group sites. We offer shuttles if you have your own boat or rentals if you prefer to use ours. We Appreciate your Business! Over 300 boats in stock! We are one of the largest outfitters in the state. We stock over 300 canoes and kayaks. You can demo boats right on the water and see what you like. If you want to try it for a four hour float trip, we have a boat for you. We also carry RV parts and supplies as well as a full line of canoe and kayak accessories. We are a one stop shop. You will feel right at home with our knowledgeable and helpful staff. Come see us ans spend the weekend if you like. 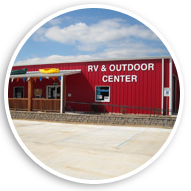 We have a 62 full hookup RV park, Rental Camper, Lodge, tent sites and group site.